Boost your confidence with a brighter smile that looks whiter and healthier. First Dental Studio offers affordable ways to brighten your smile safely and effectively. One of the easiest and most effective solutions is to simply erase deep stains and discolouration from your teeth. First Dental Studio offers two primary methods to professionally whiten your teeth: in-chair power whitening and take-home whitening that is professionally guided. If you’re short on time or looking for dramatic results in just one day, then our professional in-chair teeth whitening system is an excellent choice. First Dental Studio utilises safe and effective solutions that help to naturally lift deep stain particles within the porous surface of your teeth. The whitening treatment results can last up to two years – but the treatment itself only takes about 90 minutes so you could even do it in a longer lunch break with our handy Brisbane city dentist location! 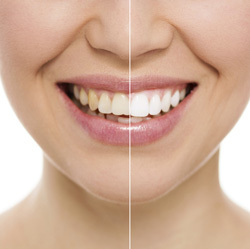 Enhance your smile with our teeth whitening options. Contact us today to ask about our zoom teeth whitening special offer. Do you prefer to whiten on your own time? Are you looking for a convenient way to extend your results? Our professionally fitted take-home whitening trays and gel do just that. After making an impression of your teeth, we will create a set of customised trays that you wear for 90 minutes a day. In two weeks, you’ll have significantly brighter teeth. Touch up at any time!